Patrick Lencioni is one of my favorite authors, having written several extraordinary business books such as The Five Dysfunctions of a Team, Death By Meeting, and Silos, Politics, and Turf Wars. Lencioni is an excellent storyteller and uses fables to convey important business insights and teachings. The Advantage was published in March of 2012 and is his first book that doesn’t employ a fable format. However, it shines in its ability to organize and convey with clarity the important teachings in his previous books, including the three I mentioned above. As a coach, I have recommended Lencioni’s books to countless clients. Invariably, I perceive a noticeable improvement, both individually and at the organizational level, when leaders apply the principles in these books. Build a cohesive leadership team. This begins by ensuring that the right people are sitting on the executive team. The team must also commit to themselves and each other to do the ongoing work required to develop and maintain a high-performing team. Once that commitment is established, team members must master five behaviors originally outlined in The Five Dysfunctions of a Team. Create clarity. The purpose of this discipline is to create alignment at the executive level. To build on this, Lencioni asks 6 simple but critical questions that help eliminate discrepancies among team members. Overcommunicate clarity. Once a leadership team has become cohesive and established clarity around the six critical questions, it needs to communicate the answers to employees over and over again. Lencioni introduces four communication strategies for messaging to be consistent and easily absorbed by employees. Reinforce clarity. For an organization to be healthy, organizational clarity must become embedded into the fabric of the organization. Systems in the following areas need to tie to the six critical questions discussed above: Recruiting and hiring, managing performance, compensation and rewards, and real-time recognition. I find The Advantage to be an important book for a coach to have in their leadership toolkit. Not only is it well-organized, clear, and easy to read, it’s also full of examples and suggested exercises to help leaders implement the four disciplines in the book. Lencioni, Patrick (2012). 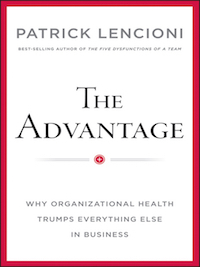 The Advantage: Why Organizational Health Trumps Everything Else in Business. San Francisco: Jossey-Bass.